Keeper Carcette, a Breton, is the Keeper of the Vigil in Skyrim, the leader of the Vigilants of Stendarr in the province. She is found in the Hall of the Vigilant where, according to her followers, she dispenses healing or justice as necessary. Besides her unique introduction ("I am Keeper of the Vigil here in Skyrim. We bring Stendarr's Mercy to the innocent and His Justice to the Daedra.") and the option to ask her for expert-level Restoration training, she has little dialogue that is different from other members of her faction. Carcette wears apprentice robes of Restoration along with steel plate gauntlets, steel plate boots, and an Amulet of Stendarr. She carries a belted tunic, a leveled enchanted warhammer, a torch, a potion of cure disease, and three leveled potions of healing. With the Dawnguard add-on installed, the Hall of the Vigilant will be destroyed by vampires once you reach level 10 or have completed the quest Dawnguard. According to Vigilant Tolan, Keeper Carcette was killed in the attack, although her body is not present at the ruins of the Hall. 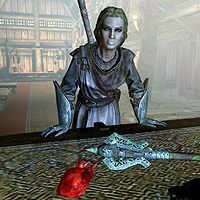 She can sometimes be found carrying a Daedric weapon, despite it going against everything she and the other Vigilants of Stendarr say and do in the game regarding Daedric objects. While Keeper Carcette offers expert training in Restoration, the dialogue to do so becomes unavailable once your Restoration skill reaches 50 or above. This page was last modified on 21 September 2018, at 02:47.